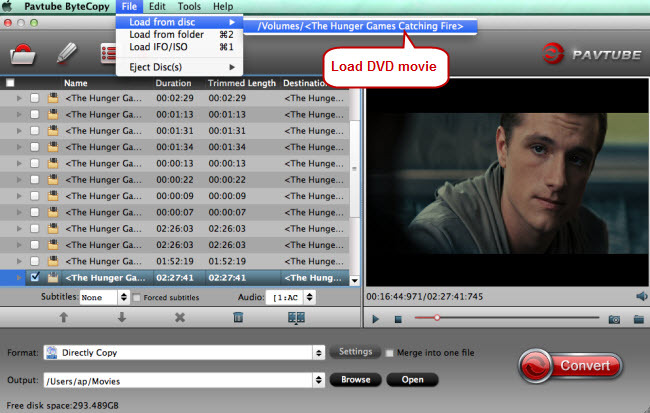 Pavtube ByteCopy for Mac is a software tool that can be used in order to aid individuals in ripping DVDs, BDs, and ISO and IFO images, and transforming the video contents to an MKV format. The installation process you are required to go through is surprise-free and it does not last longer than a few seconds, while the interface you are greeted by presents a modern and clean build. It contains a menu bar, a few shortcut buttons and a panel which displays the uploaded items. It is accessible to all user types, from beginners to highly experienced people. Furthermore, comprehensive Help contents are provided, thus ensuring that any problem can be addressed and resolved. This software utility enables you to use ISO and IFO files, and DVD or BD folders from the hard drive, as well as DVDs and Blu-ray discs. These can only be uploaded with the help of the incorporated file browser, as the “drag and drop” function is not supported. Aside from that, you can preview the added movie and change the output directory. You should also know it is possible to select another resolution from a built-in list, as well as change the number of frames per second, bit rate, video and audio codec, sample rate and number of channels. The conversion process does not put a strain on the system’s performance, as the CPU and memory usage is kept at a lot level at all times. To sum up, Pavtube ByteCopy for Mac is a pretty efficient piece of software when it comes to ripping DVDs and Blu-ray discs and converting them to an MKV format. The interface is intuitive, Help contents are provided and the response time is good. Nonetheless, you should know it lacks some of the options other similar products include.